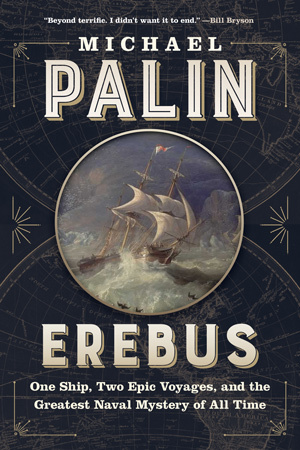 The explorers left England in 1845 as newspaper headlines extolled the “INTREPID FRANKLIN EXPEDITION.” Franklin was on three previous polar expeditions and Francis Crozier, the captain of the Erebus, was a veteran of six. James Fitzjames, captain of the Terror, owned a commendable record. The voyage would be a feather in Franklin’s cap. At age 59 he was ringing down the curtain on an exemplary career in the British Royal Navy. If he had fulfilled his orders to traverse the last unnavigated section of the Northwest Passage, he would have captured the Holy Grail of polar expeditions. Instead, the venture was the last voyage for the acclaimed commander who was knighted by the Queen in 1829. It was the last journey for his men as well, whose names are etched in the annals of the ill-fated mission along with the haunting accusation of cannibalism. In 1854, a surveyor from the Hudson Bay Company spoke with Inuits who remembered seeing “ice bound ships.” They said they encountered about 40 men dragging two boats mounted on sledges along the west coast of King William Island which is now part of Nunavut Province. They appeared to be heading for Back’s Great Fish River on the Canadian mainland. The Inuits, who disliked being called “Eskimos,” were indigenous people inhabiting the Arctic regions of Canada, Greenland and Alaska. One of them related how he traded seal meat for a pocket knife and watch fob. Hindered by the language barrier and eager to reach the mainland, the survivors moved on. In 1859, a search party found a message in a cairn on King William Island written by Captains Crozier and Fitzjames. Dated April 25, 1848, it verified the abandonment of the flagship HMS Erebus and its sister ship, HMS Terror. 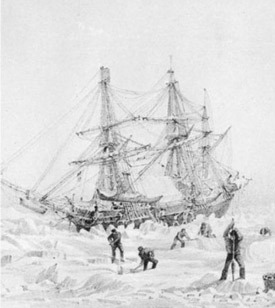 It revealed the ships remained trapped in the ice for nearly two years, the Eberus in Victoria Strait, which separates Victoria Island from King Edward Island, and the Terror in its namesake bay nearby. Franklin and 23 crew died in 1847. By 1848, the 105 remaining hands had deserted their ships and were presumed dead. Again, in 1859, more pieces of the puzzle fit when a final search party sent by the commander’s wife, Lady Jane Franklin, found skeletal remains on King Edward Island. Historians think the victims may have succumbed to hypothermia, scurvy or starvation—perhaps a combination of all three—while trekking overland to the south. Autopsies revealed the ships’ rations could have been tainted by lead and botulism. Their stores included enough canned food to last three years. The “horrifying” aspect of the discovery loomed when proof of cannibalism was supported by forensic evidence of knife blade and saw marks on bones found on the island. The timetable in searching for wrecks in the Arctic is short. Beginning in 2008, there were six searches over six years. On September 8, 2014, the Arctic Research Foundation announced the discovery of a ship by marine archaeologists from Parks Canada, a government agency. Their six week search, deployed from the Canadian Coast Guard icebreaker, Sir Wilfrid Laurier, achieved their goal using side scan sonar and an ROV (remotely operated vehicle). Located in Nunavut’s Terror Bay, off the southwest coast of King William Island, the find was identified as the Erebus when divers found the ship’s bell. John Geiger, of the participating Canadian Geographical Society, reported the hull sitting upright in 34 feet of water. Although its masts were sheared off, the wreck was virtually intact and its contents well preserved in the frigid waters. 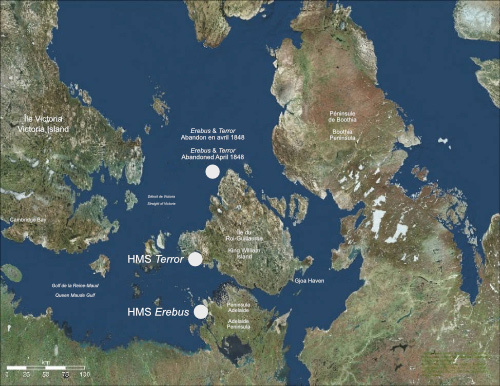 In 2016, one day short of the two year anniversary of the flagship’s discovery, the Terror was found in its namesake bay where the Inuits identified a “sinking ship.” The wreck’s three masts were broken, but still standing. Resting upright in 79 feet of water, it was only 31 miles away from the Erebus and 60 miles south of where historians thought it was lost. An Arctic Research Foundation team maneuvered an ROV through an open hatch to capture images of the galley, storage rooms and living quarters. On further surveys, divers salvaged the ship’s bell and various artifacts including cannons, rigging, machinery, plates, buttons, bottles and personal belongings. The short dive calendar provided years of work for various expeditions. Some of the artifacts, including the bells, are on display at the National Museum, Greenwich, London. Defense Minister Sir Michael Fallon deeded ownership of both sites to Canada while retaining some artifacts and the right to repatriate any human remains. 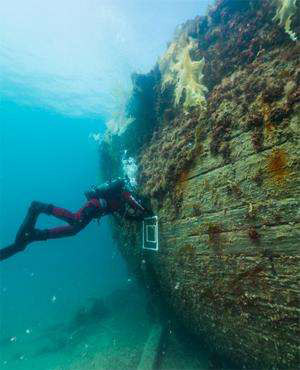 Both wrecks are protected and officially designated National Historic Sites of Canada. In Greek mythology, “Erebus” was the God of Darkness from the shadowy region of Hades. “Terror” means dreadful fear, horror and dismay. Surely the literal meaning of the misnomers does not apply to these vessels, yet the irony remains. They went through the proverbial “hell and high water,” only to suffer the tragic fate of Sir John Franklin’s last polar expedition. I appreciate the historicity of this piece, because I am always interested in history. I’ve always wondered if NUMA was real, and its nice to be able to see it real. I hope they were able to get the ships out of the water and into a museum as with some of the other things. When you see something that you read about right in front of you-it tends to make it more real, and exciting! Thank you! Keep up the good work. The Franklin Expedition ships will not be raised. They have been declared National Historic Sites of Canada, as well as protected burial grounds. Dive teams will still be exploring the vessels for further clues as to what exactly went wrong. Thanks for writing to Numa.net.